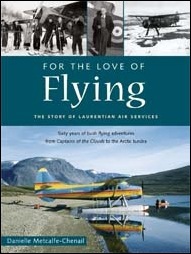 For the Love of Flying is the first book to tell the story of one of Canada’s most innovative aviation companies, Laurentian Air Services, and thus fills an important gap in Canadian aviation history. Drawing on extensive research and interviews with Laurentian’s presidents, pilots and ground crew, author Danielle Metcalfe-Chenail explores the company’s 60-year history from its founding in 1936 in Ottawa with small biplanes through to the 1990s when it was operating scheduled flights with twin-engine Beech 99s and Beech King Air 200s. During those 60 years, Laurentian was at the forefront of air tourism in the Ottawa region and the Laurentian Mountains of Quebec as well as fly-in hunting and fishing in Canada’s north. It also pioneered the use of the Grumman G-21 Goose and de Havilland Beaver commercially and provided vital air support to survey and development work for such massive undertakings as the Churchill Falls and James Bay hydroelectric projects. This book brings Laurentian’s history to life through first-hand stories and an exciting collection of colour and black and white photographs, the majority of which have not previously been published. For the Love of Flying is a long-overdue book that appeals to armchair bush flyers and aviation historians alike. Danielle Metcalfe-Chenail is a researcher and writer who comes from a family of aviation enthusiasts. She has an M.A. in history from the University of British Columbia and has written articles for several Canadian publications, including The Beaver: Canada’s History Magazine. She is an active member of the Canadian Aviation Historical Society.